Fri 09 May 2014: Earn CPE credits by attending The Honeynet Project Workshop! Attendees of the Honeynet Workshop can earn CPE credits toward ISC2 and ISACA certifications. Download the CPE Verification Form and present it to the conference desk after your sessions for validation. Please refer to ISC2 and ISACA websites for CPE policy and guidelines. Attendees are responsible for credit submission. We'd like to welcome PWC that joins the Honeynet Workshop as a Gold Sponsor. PWC has the largest practice of IT and information security in the world, employing over 3 500 highly qualified professionals in the field of information security, with over 1 200 in Europe. Every year, the company carries out globally over 20 000 projects in the fields of security, of which 75% are consulting projects or assurance, and 25% are associated with the implementation of security solutions. In CEE, PwC Cyber Security Team relies on experts with many years of experience in the role of heads of IT security or key specialists with largest technology companies and financial services in Poland, and experienced security auditors. Services provided by PWC include the following: information security strategy, information security management, threat and vulnerability management, architecture, application and network security, infrastructure, incident handling, monitoring, investigations, business continuity planning and disaster recovery. In-depth interview with Felix Leder. In-depth interview with Angelo Dell'Aera. The training course held by Tillman Werner, "Understanding and Mitigating Botnets" is almost sold out. Register while you can! In-depth interview with Lukas Rist. In-depth interview with Maximilian Hils. In-depth interview with Sebastian Poeplau. The honeynet project is excited and proud to have Deutsche Telekom aboard as a platinum sponsor for our annual workshop in Warsaw. Deutsche Telekom is one of the world's leading integrated telecommunications companies, with some 143 million mobile customers, 31 million fixed-network and more than 17 million broadband lines. More information about Deutsche Telekom can be found here. We'd like to welcome Codenomicon Ltd. that joins the 2014 Sponsorship team as an individual sponsor! Codenomicon develops security and quality testing software, which allows users to quickly find and identify both known and previously unknown flaws before business-critical products or services are deployed. Their unique, targeted approach to the fuzz testing of networked and mobile applications exposes more flaws and weaknesses than any other testing platform or methodology. This is Codenomicon Ltd.'s first time sponsoring the Honeynet Project workshop and we gratefully acknowledge its sponsorship and supports. Currently FIRST has nearly 300 members, spread over Africa, the Americas, Asia, Europe and Oceania. This is their first time sponsoring the Honeynet Project workshop and we are very excited to have them aboard. Join the most fantastic security workshop, May 12-14 in Warsaw, Poland. Check out the agenda and much more on workshop website. Save $190 with Early Bird rates before they expire April 10th - Register now! Sat 5 April 2014: WIN A HONEYNET WORKSHOP FREE PASS! 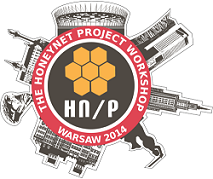 Do you want to attend the 2014 Honeynet Project Workshop for free ? Be the first one to solve the CrackMe competition designed by CERT Polska, you'll win a free workshop pass. Play it now! Thu 3 April 2014: WORLD-WIDE SECURITY TRAINING YOU CANNOT AFFORD TO MISS! The Honeynet Project will offer 4 world class training courses during the 2014 workshop. The topics include (1)Understanding and Mitigating Botnets by Tillmann Werner (2)Virtualization Security by Brian Hay (3)Reverse Engineering Android Malware by Mahmud Rahman (4)Malware Reverse Engineering by Felix Leder. More courses introduction here. Don’t miss the trainings, register now!. We'll provide a discounted rate of $110USD for a double room per night at JM Apart Hotel for registrations within the early bird period. More JM Apart Hotel information here http://warsaw2014.honeynet.org/venue.html. Want to meet and have breakfast with speakers and project members in the same hotel? Register now! Tue 18 February 2014: REGISTER FOR THE WORKSHOP NOW! Registration for the 2014 Honeynet Project Workshop is now open. The Workshop is a 3-day event that features 2 full days of briefing sessions along with live demonstrations and 1 full day of hands-on training sessions. Early bird registration rates are available from now to April 10th, 2014. SAVE MONEY, REGISTER NOW! The 2014 Honeynet Project Security Workshop brings together experts in the field of information security from around the world to share the latest advances and threats in information security research. Organized by the The Honeynet Project this three-day workshop features a rare, outstanding line-up of international security professionals who will present on the latest research tools and findings in the field. This year's workshop will be held in Warsaw Poland on 12-14 May 2014.